Fri., Aug. 3, 2018, 8:42 a.m.
NEW YORK – Susan Hewitt found a special prize recently while wandering the streets of New York. The 70-year-old spotted a mysterious patch of bright green leaves with tiny white flowers in a raised flower bed. It turned out to be tropical Mexican clover, a weed common in South America and Florida’s orange groves, but never recorded before in the state. Hewitt volunteers for an ambitious project to photograph all the wild plants that dwell in New York City. On Friday, the organizers announced that citizen scientists had catalogued more than 26,000 sightings, and documented new populations of invasive species and native weeds that seem to be disappearing, like the green comet milkweed. Started last year by scientists at the New York Botanical Garden, the effort makes up for the lack of manpower to survey the entire city. The project so far has attracted 730 volunteers armed with smartphones who’ve hit the streets for the quest, called New York City EcoFlora. Hewitt, a self-described naturalist who grew up near the English village where Charles Darwin lived, made her discovery last month in front of a massive apartment building in Manhattan’s Upper East Side. She fires up her iPhone X every time she spots something new or interesting. A fragile tree seedling sticking out of a manhole cover? Click. A white petunia hidden among weeds? Click. Botanist Brian Boom, who heads the project, said the scientific community wasn’t really thinking about the need to engage with regular folks when he was a graduate student in the early 1980s. “There was a sense of, ‘This is what we do. And you can go out and look at the birds and that’s great. But, you know, we’ll do the science,’” he said. Not anymore. Scientists have become increasingly aware of how citizens can contribute to their research. 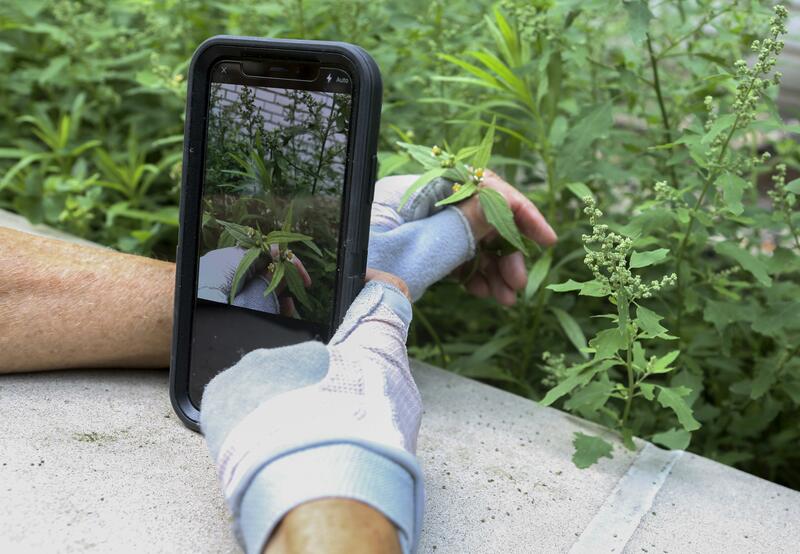 Digital platforms like iNaturalist, a mobile app where citizens share their observations of plants and animals, estimate that people have made dozens of noteworthy discoveries around the world. And a 2017 study found that more than half the material in the Global Biodiversity Information Facility –an open-access database with information about all types of life on Earth– comes from volunteers. Citizen scientists in the EcoFlora effort have documented at least six plants never recorded before in New York state and two new plants for North America. The observations already are helping prepare for future threats. In July, the project challenged its volunteers to locate every tree of heaven in the city. These rapidly growing trees with pale gray bark and a stinky smell are the preferred host of an Asian moth that can harm crops and forests. Mapping the host plant will allow researchers know where to look for the insect once it shows up. Volunteers have their own reasons for participating. Zihao Wang, 29, used to look for plants on his own, exploring the green patches he found on Google Maps. Now, he’s one of the most active members with 538 species identified so far. When he’s not hunting for plants as a hobby, he works for the city’s parks department. Published: Aug. 3, 2018, 8:42 a.m.